Readers, I have in my hands, a copy of the Op Shop Guide (Victoria) written by Kelly Lainson. Kelly Lainson, a resourceful and enthusiastic bargain hunter, has compiled an extensive alphabetical listing of Victorian Op Shops. 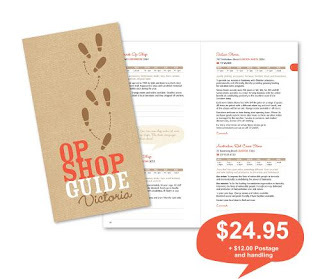 'The ‘Op Shop Guide (Victoria)’ is a stylish, practical and easy reference directory to locating and shopping at these valuable outlets. Each Op Shop is recorded by its suburb. The index lists Op Shops by name. There are over 380 pages detailing 773 Op Shops. It delivers an overview of the stores’ purposes location and operational details. Kelly spent a lot of time researching for her book; calling pubs in towns in order to establish the whereabouts of local op shops, sending letters, and in some cases receiving personal hand written notes back from op shop staff, detailing such things as shop history, disability or pram access, and discount days. e.g. Page 242: The Three Legged Chair Op Shop, 18 Progress Street, Mornington "each week 20% of our clothing is reduced to just $1." To hear more on Kelly's book research, you can listen to a radio interview here. Scattered throughout the book, you will find little tips such as "Handy Hint #05 'Scrub stains with a toothbrush and sard wonder soap to get clothes looking like new' "
I would very much like to keep this book for myself, but instead I will be giving it away to one Recycled Fashion follower. To be in for a chance to win the Op Shop Guide (Victoria), leave a comment below with your own op/thrift shop handy hint. The winner will be drawn in a week from now. International entries are welcome, although the book will not be useful to you unless you intend to travel to Victoria, Australia any time soon! My hint: if feeling overwhelmed by racks & racks of clothes, look for patterns & colours that stand out first, size & fit later. 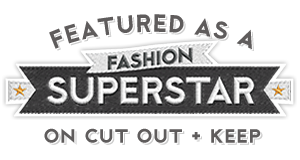 Some garments can be adjusted for fit later or totally refashioned. My tip would be - leave no stone unturned! Search through sections which you would think would hold no interest for you. Sometimes op shop staff categorise objects in strange ways, which is why I found my cape in the homewares section!! Ooh, I would love love to have this! -Know your local stores’ sale or re-stocking days, of course. -Turn on your creative brain. See everything as a novelty item that can be further customized with minor tailoring. This will make it even more unique. -Start in the accessories section. I almost always find one piece that inspires the rest of my shopping trip. You’d be amazed how much one ring, or one really interesting scarf can transform an outfit you already have, or inspire you to look for other pieces you wouldn’t normally think of. -Items that are a bit more high-maintenance (require dry cleaning) are often good finds, since they’ve been better looked after, are made of more sophisticated fabrics, and can last longer… silks, wool, etc. Wonderful! It's always fun visiting an area and checking out their opshops. A book like this would be great to find out shops' opening hours. What I usually look for when I go into a shop are colour first, then look at the style for clothes. oh can't wait to see that new book. If i dont win this im certainly buying it but it never hurts to have a go! My tip never give up on op shopping if you go and find nothing go the next week, stock rotates fast and also look harder go through everything and think outside the box. Sounds like a great book, wow! My tip would be to frequent your local op-shops and make an effort to be-friend the volunteers....if you have a love for a particular decade of clothing, or are on the search for something in particular - let them know! Chances are if they remember you and come across that special something, they will keep it aside for you. The op-shop ladies (and men!) are your best friend! 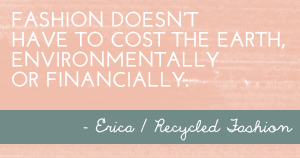 I just featured you as a guest poster for your Full Length Skirt to Top in 4 Easy Steps post! My latest fad is to keep an eye out for 100% wool garments that are beyond their best. They can be transformed into gorgeous toys by felting the wool (and cutting around any stains etc if needed).